The Dragon Quest series, known as Dragon Warrior in the US until the release of Dragon Quest VIII, is the prototype for the entire JRPG genre. Originally inspired by complicated western role-playing computer games like Wizardry and Ultima, Dragon Quest simplified the formula and ended up becoming the most massively successful game series ever in Japan. In the United States though, the series has always played second fiddle (or maybe fourth or fifth fiddle) to the prettier and more cinematic Final Fantasy series. You can’t really blame the US though; we never officially got the fifth or sixth installments in this country at all until they were remade for the Nintendo DS. And although we did finally receive Dragon Warrior VII for PlayStation, it did not arrive until 2001, a full year after the release of PlayStation 2. I myself did not get my hands on the game until 13 years later. In spite of its absolute adherence to tradition and an almost complete lack of innovation in its gameplay, I find that Dragon Warrior VII still holds up surprisingly well by today’s standards. I would even argue that, in both good and bad ways, this game pushes the concept of the traditional JRPG to its limit. At least it’s vibrant… whenever you’re not in a cave. Let me say this in no uncertain terms–Dragon Warrior VII is ugly. It features 2D sprites in a 3D world, and while all the monster art is drawn well (as faithfully adapted from the illustrations of series artist Akira Toriyama), the rest of the sprites in the game are small and generic. Chrono Trigger came out in 1995, and yet its sprites are about a dozen times prettier than anything you will ever see in this game. The 3D architecture meanwhile is passable at best. There is the occasional very cool dungeon design, with one extraordinary standout, but most of the time the 3D graphics are standard PlayStation 1-era chunkiness. If you compare this game graphically to Squaresoft’s offerings of Xenogears, Final Fantasy IX, and Chrono Cross, it makes you wonder how the heck it took Enix five years after the release of Dragon Quest VI to create this homely game. The soundtrack meanwhile, provided by regular series composer Koichi Sugiyama, is not a disappointment, though it is not especially memorable either. None of the tracks really stood out to me, aside from the grandiose main theme. There might have been one or two songs that I would have enjoyed if I would have heard them less often, but that doesn’t happen. The same handful of songs populate most of the locations in the game–the “dungeon” song, the “town” song, the “town-that-is-depressed” song, etc. Considering you can easily spend 70-100 hours on this game, the music definitely wears on you after a while. But before I move on, I do need to elaborate on that aforementioned standout dungeon, because it is truly awesome. Toward the end of the game, you find yourself in a maze, (Actually, everything is a maze in this game.) and what makes it unique is that the entire dungeon rotates on demand. The dungeon is literally just an odd arrangement of geometric shapes cut at 90 degree angles. You can walk up and down the walls, and the perspective of the shapes will shift and gravity will change to accommodate you. It is an incredible accomplishment for a PlayStation game, and even in modern gaming, the only analogous example I can think of is Super Mario Galaxy. Combat and leveling in Dragon Warrior VII is completely traditional to the standards of the genre that the rest of the series had established. The game only differentiates itself in two ways–high customization for party member development, and high difficulty level. Although it takes roughly a whopping 20 hours to unlock classes, once you finally have them, you can turn your party into things like Fighters, Clerics, Thieves, or Mariners. Mastery of certain specific classes unlocks stronger classes, such as the unlikely TeenIdol and the powerful Godhand. There are even rare monster classes that your party members can adopt. Any new skills or magic abilities obtained from a given class remain usable even when you switch classes. Additional hybrid skills can be learned by gaining enough proficiency in specific pairings of classes. Basically, if you want to create an offensive juggernaut who is also a great healer, that is very easy to do (heck, that’s basically what the Paladin class is). If you pick the right spots to class grind, you can develop a pretty diverse and powerful party in just a few hours. If you choose not to grind though, well, good luck to you. 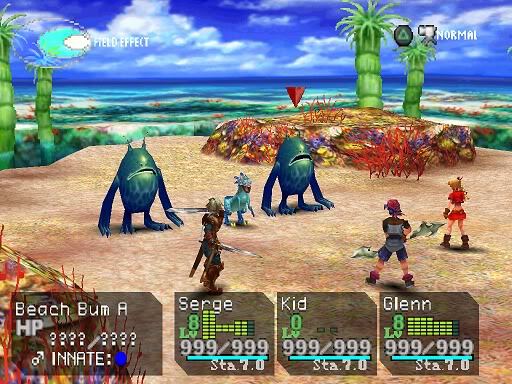 The monsters hit irrationally hard at times in this game, with very high HP toward the end. There even reaches a point early on where you should probably stop using the “Attack” command at all, because there are MP-free skills that do higher damage to more targets. Dragon Warrior VII is the one game I’ve played where taking advantage of class grinding does not feel like a cheat to get ahead; it feels like it was intended that way all along. I had to gain over 10 levels, while continuing to master classes, in order to beat the final boss. The game is that punishing. One more curiosity I noticed in the “early” portion of the game–at least those first 20 hours–is a dependency on treasure chests. Monsters do not actually yield much money in this game, so if you want to have any chance at affording the newest and best equipment at a shop, you need to hunt down every chest in a dungeon. These will usually provide the hundreds of gold you need to keep your party alive. Even when you reach a point where you become less dependent on chests though, you will still never be able to afford all the new gear that is regularly available. You have to weigh carefully who is in the most need of a new weapon or armor. This frugality is not actually something I can recall seeing very often in a JRPG. Long ago, the Demon Lord sealed away the various islands and continents that made up the world during his war with God. Your peaceful island is all that remains, and seemingly in the absence of God and the Demon Lord both, you (the nameless “Hero”) and your friends task yourselves with literally reuniting the world. By collecting rock shards scattered across the globe, you enable time travel that lets you go to the past to fix the problems that sealed away the rest of the world, one land mass at a time. Then you can visit those restored lands in the present-day world to see how they have changed. What this does is break down the entire narrative of the game into episodic vignettes, where one episode is only rarely and tangentially related to any of the others. There are two major insights to be drawn from this decision, one good and one bad, and it is the aspect of the game I find most unique. There are a LOT of graveyards in this game. Let’s start with the good. 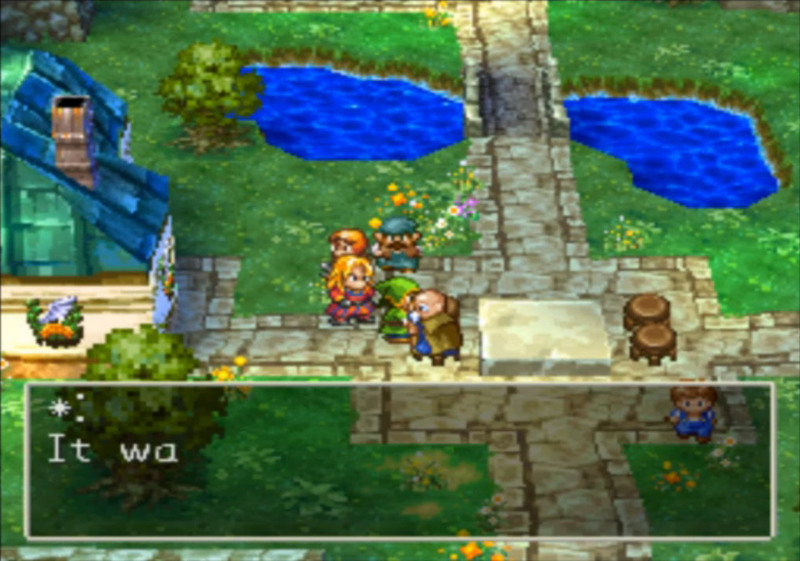 In a game like Lufia: Rise of the Sinistrals or even the other Dragon Quest games, you go from town to town, meeting people who coincidentally always have a crisis that they are helpless to resolve themselves. Luckily, you are there to swoop in and save the day, usually by killing someone in a cave. Then they live happily ever after. This motif actually does not play out in Dragon Warrior VII. You will run into sorrow and loss just as often as you run into joy and triumph. In the past, there is a town where nearly everyone dies, and you can’t do anything about it. There are multiple scenarios that end with a person deciding to go into exile, usually as a means of coping with a broken heart. Again, you are powerless to take these people by the hand and make it all better. All you can do is help where your muscle is appreciated, but when it comes to general human strife, you are just a bystander. 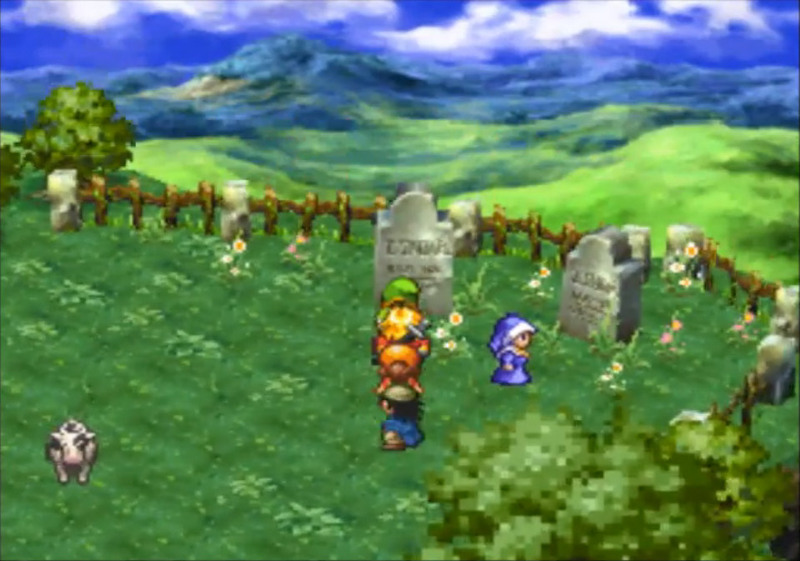 Although, much to the game’s credit, the despair that might conclude the story in the “past” version of a town often becomes a source of joy later on. Two of the aforementioned men who go into exile end up becoming saviors for other towns, for instance. Even here though, the game does not practice blind optimism, where all negatives beget positives. There are some instances where a town in the present outright forgets the people who struggled to preserve peace in the past, and sometimes, the townspeople even practice revisionist history to make themselves look better. You just never know what will survive the passage of time in this game, and that’s awesome. It highlights the implausibility of a group of random travelers being able to solve all the world’s problems, even though the game is literally about you reuniting the whole world. Dragon Warrior VII simultaneously embraces and flips the table on the most basic trope of the JRPG, and I cannot recall seeing anything else like this before or since the game’s release. It truly stands out from the rest of the entire series in this regard. Now, I move on to the downside of this episodic storytelling style. Strictly from a time/investment standpoint, since the various episodes of this game are so rarely connected with each other, it leaves one to wonder just how necessary the inclusion of several of these episodes was in the game. The game tries very hard to distinguish one episode from another, but in the end, progressing the story usually just comes down to you finding and killing the monster who won’t stop harassing whichever town you’ve found most recently. I mean, should the player really have to go through 20 hours of world-saving before he/she can even unlock classes, the most important aspect of the battle system? Sometimes, it feels like the game is just feeding you busywork to pad out its length. This might be forgivable if the game was otherwise highly intuitive, but it’s not. Not only does Dragon Warrior VII refuse to hold your hand as a gamer, it will take your hand and smack you for your laziness. There are many times in this game, especially early on, where there is little or no indication what you are supposed to do next. Indeed, the aforementioned shards (which are mostly required to progress in the game) are found in completely random locations–in dungeon chests, in house basements, acquired from doing errands for people. Most of the time, through proper exploration you should run into them all. But imagine that you missed one shard four hours ago that halts your current progress, and you don’t know when you missed that shard, so you now have to spend that many hours backtracking to find it. In the interest of time, I used strategy guides to help me through the game faster, and it still took me a little under 80 hours to complete. Without a guide, I very easily could have spent 80-100+ hours completing the game, and that does not include unlocking and completing the secret bonus dungeons, which could take up dozens more hours if I elected to try them. It forces you to ask a philosophical question about RPGs in general–how much is enough? I spent nearly a hundred hours addicted to Dragon Age: Inquisition, but a part of me was screaming out for it to end somewhere around the 700th time I collected Elfroot. Fatigue definitely set in with Dragon Warrior VII too around the 65-hour mark. But while I admitted myself that the filler in Inquisition was all optional, much of it is mandatory in this game. Part of the joy of experiencing an RPG is taking it on faith that all the disparate elements of the plot will coalesce in some grand way by the end (even if the execution is somewhat lacking… which is most RPGs ever made, to be fair). This is one reason why many big RPG fans like myself don’t mind a little monotony in the combat of a lengthy game. Some RPGs have stories that are directly to the point (again, like Lufia), while others have stories so labyrinthine that they are almost impossible to digest in one sitting (Xenogears being the obvious example). But the point is that either style of storytelling builds toward a dramatic and satisfying conclusion. The episodic storytelling robs Dragon Warrior VII of its chance to build tension. You are smart enough to know you will probably end up fighting the Demon Lord in some form or another, but the game only ever skirts around the issue for literally dozens of hours. By the time you reach the final battle, it kind of feels more like you are going through the motions instead of having a climactic confrontation. The game literally implies that you have become more powerful than God by the conclusion, but nobody really seems to notice or care that much. It just is what it is, and then it’s over–after investing days’ worth of time in the game. And yet the game is nonetheless packed so full with content that it leaves me ambivalent. In addition to the mandatory questing and optional bonus dungeons, there is a bestiary to fill up, casinos at which to bet your gold, and a Monster Park in which you can tame nearly every monster you see in the game to live in peace at one silly location. There is even an empty town that you have to help populate with migrants from other towns. Then on top of all that there are yet more a handful of sidequests here and there. If the point of an RPG is to let you live in a new world and experience everything there is to do, then I guess Dragon Warrior VII succeeds marvelously for a PlayStation game, just as Inquisition succeeds as a PlayStation 4 game. But if you are the type of person like me, who shies away from open-world games like Skyrim in favor of more story-driven experiences like The Last Story, then you are going to be left disappointed by this game’s lackadaisical attitude to story progression. I was going to conclude that you can’t have it both ways, that you can’t have a sweeping open world and a satisfying story-driven experience in one RPG. But then I remembered that Xenoblade Chronicles does exactly that, so I guess my new conclusion to this tangent is that everyone should just go play that game. Really, go do that. Dragon Warrior VII wears its heart on its sleeve. You know exactly what this game is about–fighting monsters, getting stronger, and smiling while you do it. Indeed, one last thing I did not manage to mention earlier is just how funny this game is. The NPCs always speak in a natural voice with practical concerns. My favorite NPC was a character who dreaded his wife’s cooking, and I would check in on him from time to time to see how his feelings had changed. The game is full of completely inconsequential moments like this that make the world feel so much more alive. There are more direct (and absurd) jokes too, such as a rich man who has made a game out of chasing his attractive maids around his table. If a maid can make it 100 laps without getting felt up, she wins a prize. Is that stupid? Yes. Sexist? Oh, yeah. Hilarious? Extremely. 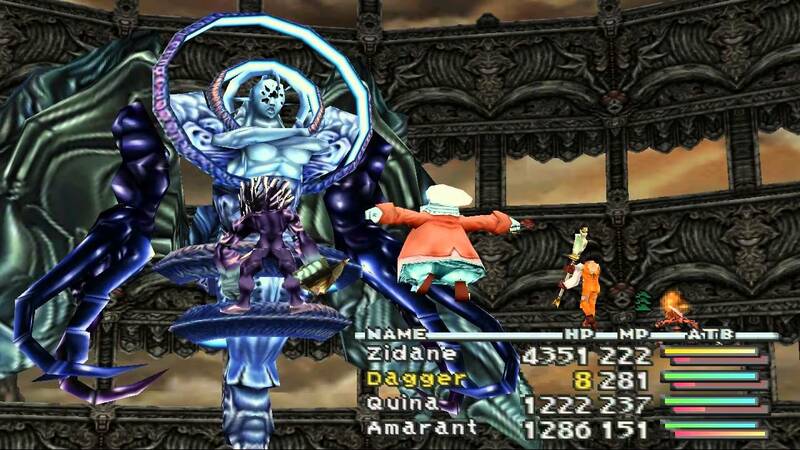 You’ll probably never see a numbered Final Fantasy that makes you laugh like Dragon Quest. At the end of the day, Dragon Warrior VII is far from perfect, but it is still a timeless entry in a timeless series. And that the humor in this game is tempered by a sense of realism not seen in perhaps any other JRPG before or since makes it that much more remarkable. If you have a lot of free time on your hands, and you are looking for a game that just lets you feel like a powerful warrior, then this might be the thing for you. Yay Dragon Quest ❤ I've always loved the series and the fact that it sticks to party building and combat instead of crazy over the top stories like Final Fantasy. I was never a fan of episodic storytelling and Dragon Quest 4 really derailed things for me. I'd rather stick with my party than have episodes that build to something. I hear where you’re coming from. I actually don’t mind episodic storytelling when you’re sure it’s building toward something, but that sure wasn’t the case with this game haha. Me personally, I actually really liked games that were constantly mixing up your party, my favorite examples being Final Fantasy IV, Phantasy Star IV, and Lunar: The Silver Star. There was no customization, but there didn’t need to be, because the games were always handing you new battle configurations. I guess I’m just not a big stat junkie. A lot of fun can be had with both styles though!